To that end, I wrote a flashcard program, which takes external dictionary files. So far the only dictionary file that could be considered "complete" is this file that contains 1153 entries from all of the chapters from the Teach Yourself Cantonese book. This file will remain static and will see no further updates. (Rename flashcan-tyc.dat to flashcan.dat to use this file after downloading.) 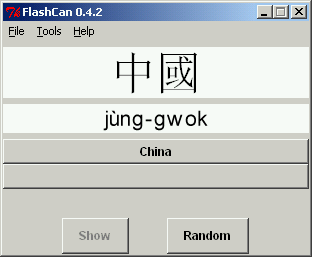 That said, the flashcan.dat dictionary file will continue to be added to as I continue my adventure in the Cantonese language. I'm now making a start on the book "Colloquial Cantonese". The flashcan.dat file will be updated, merging entries with those from TYC where appropriate. The detailed ChangeLog for the software. Dictionary file flashcan.dat - this is the one that gets updated. Dictionary file flashcan-tyc.dat - Just contains the vocabulary used in the TYC book. Rename to flashcan.dat after downloading to use. Dictionary file flashcan-mandarin.dat - Donated dictionary file in Mandarin. Again, rename to flashcan.dat after downloading. To run the program you need either the Windows binary or the Tcl/Tk source, and a dictionary file. The Mandarin dictionary was donated by a FlashCan user, as such I cannot maintain it. However if anyone wishes to send any updates to it I'll upload them. System Requirements: The Windows binary should work with Windows 98/NT4 and later. Running the Tcl/Tk source as a script requires Tcl/Tk 8.3 (or later) for your platform. It is developed under Linux and works out of the box with any recent distribution. FlashCan is copyright ©2005-2011 Michael McConnell, and is free software licensed under the GNU General Public Licence, version 2. 25 October 2011: Ver 0.8.4 Fixed a bug in the Numeric Yale handling, which would occasionally render tone 4 as tone 7. 04 May 2011: Ver 0.8.3 Fixed a bug in the Numeric Yale handling. The Cantonese dictionaries are now in the Numeric Yale format. 24 April 2011: Ver 0.8.2 Bug-fixed the Numeric Yale handling, to allow Cantonese dictionaries to use this format without error. Numeric Yale searching on tone 1 also searches tone 7. 04 July 2010: Dictionary now complete for the TYC book, with a copy locked at flashcan-tyc.dat. 06 June 2010: Ver 0.8.1 Minor tweak with the search dialogue window - pressing Enter now actually performs the search. Dictionary updated to include chapter 23. 09 May 2010: Ver 0.8.0 Searching by English meaning is now case insensitive. 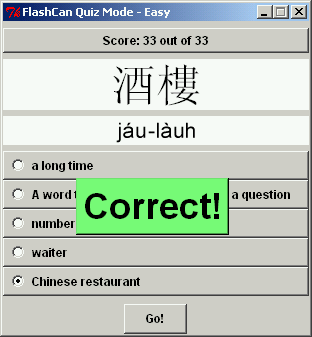 Searching by Cantonese now also recognises the numeric Yale form. Fixed the accelerator key for "Reverse Quiz" menu option. The tone-insensitive search is now completely tone-insensitive but this will of course only work for a Cantonese dictionary. See the technical information for more details. 18 April 2010: Ver 0.7.3 Minor tweak with the font display. The Help->About window now shows the number of dictionary entries. 29 January 2010: Ver 0.7.2 (at long last!) New almost tone-insensitive search (still matches 'h' though) and romanised searches now show the romanisation properly.